Kudos to Donna Meyer. She made 365 books in just slightly over 365 days. As someone who couldn't even complete her Word-a-Day Journal, I am in awe. Hi, and welcome to this year-long project. So what's this all about and how did it happen, you might ask. In mid 2007, artist Noah Scalin decided to make a skull out of anything he could find, every day for a year. It stretched him in ways he never imagined, as an artist, a writer and a person. His experience turned into a blog that went viral, and then a book. Others have picked up on the idea: 365 Hearts, 365 Masks, 365 Bears drawn on a cellphone, 365 paper napkin mustaches. I wanted to play, too, and I chose books. I love books, I know a bit about making books (thanks to my talented book-maker sister, Marilyn Worrix), and they're broad enough in definition to give me a lot of creative leeway. The whole point is not really the books. The idea is to stretch myself in many ways as an artist and a person, to set up a discipline, stick with it and see what that teaches me. I hope you'll join with me and follow along on the journey chronicled here, and let me know what you think. Donna has made a lot of different kinds of books. 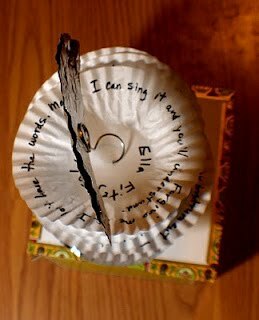 Many are upcycled journals using a variety of materials. You know how I love using recycled materials. I especially like this one from a Chinese takeout container. Today's book is really more of a prototype. The craft is pretty sloppy, but I just wanted to see if the idea would work, and I think it does. 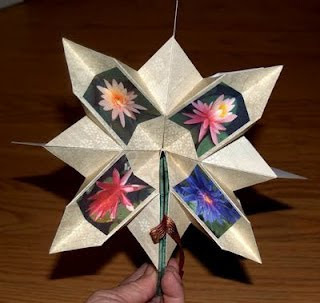 It will be fun to make this again at some point down the road but taking more time and care and using better material. The germ of this idea came today when I was in the kitchen and looked over to see a package of cupcake papers on the counter. Of course, my first thought was... "What could I do with those?" I started playing around with them, folded some, flattened some out. The flattened ones had waves from the rippled edges. Hmmm. Water, the sea, sand dunes? No, too mundane. But definitely a sense of movement. Like music. Like ripples of music. Like a John Coltrane riff. I remembered I had a whole collection of quotations about Jazz. So without thinking too much about how it was going to come out, I picked up a black marking pen and starting writing the quotations onto the flattened papers, writing them in spirals around the edge. The spirals suggested a spiral binding of some sort. But they were round. How could that work? Put the spiral wire up the middle. Bend and wind part of the wire into a base, then into a top. 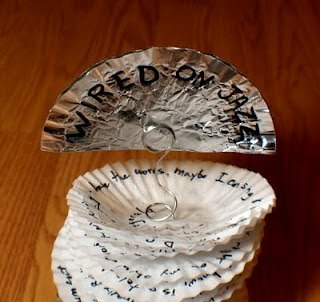 Thread the papers on and let them flutter, so every time the thing is moved--or hit by a breeze or even touched--the leaves of jazz will flutter... like music. And so, here is "Wired on Jazz." I'm quite happy with this idea. Can't wait to take it further. 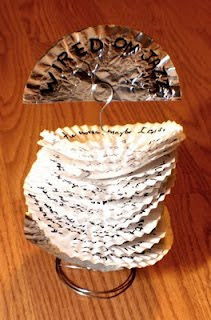 The whole thing stands about 8" high from the coiled wire base to the top of the silver "fan." The section of 14 "pages" is about 4 1/2" high. You can read each of the quotations by lifting the pages above each one and turning the entire book. 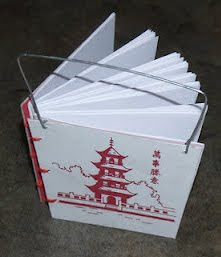 Spend some time at 365: Make a Book a Day and be impressed and inspired. Susan - Thanks so much for featuring my project. It has been an amazing year. I've learned so much - not just about making books but also about myself. And one of the main things I learned? I want to make more books, better books, more complex books, more mind-stretching books. I'll keep posting them. Susan - Thanks so much for featuring my year-long project and the blog that chronicles it. It has been an amazing year and I learned so much--about making books but, even more importantly, about myself. I love making books and will continue to do so--and to share the adventure with my blog followers. Thanks for being one.